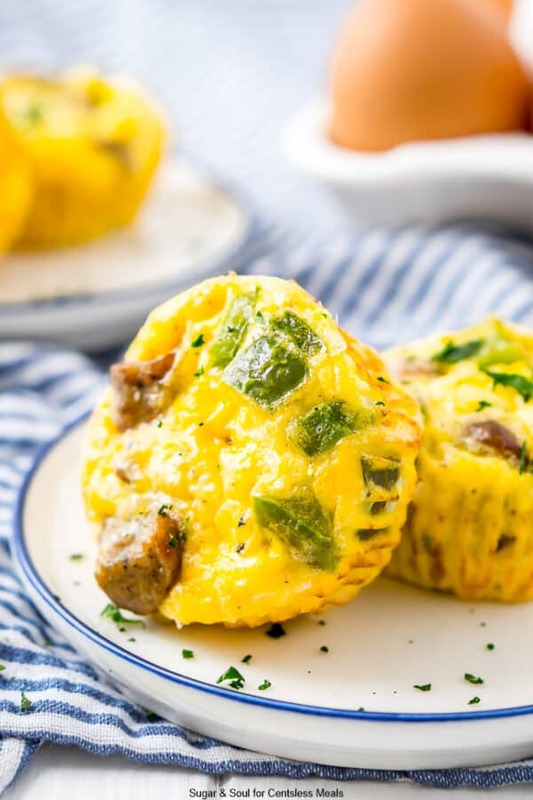 Mini Quiche is perfect for weekend brunch and busy weekday mornings alike! Pin it to your BRUNCH BOARD to SAVE it for later! This is a crustless quiche recipe that’s ready in just 30 minutes! 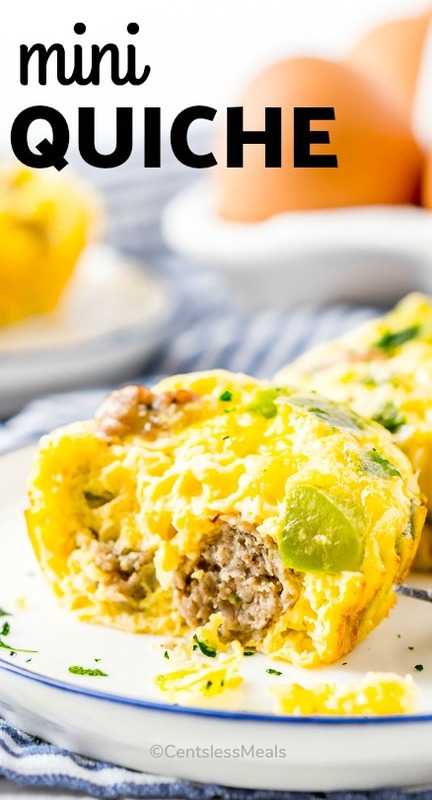 Loaded with green peppers, sausage, and Monterey Jack cheese, everyone will rave about this recipe! 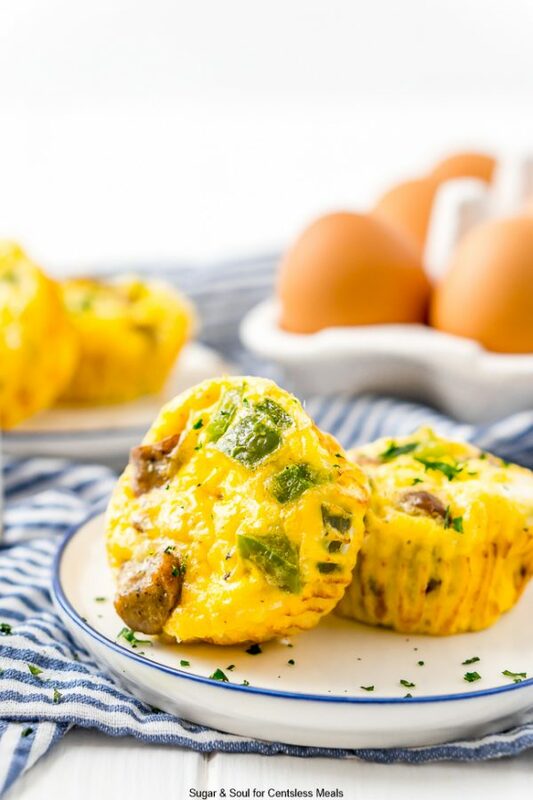 With spring just around the corner (we hope) this Mini Quiche recipe is sure to come in handy for Easter, brunch, and quick mornings before you head out to enjoy the beautiful weather! This Mini Quiche recipe is great because it’s super simple to make and freezes so well. 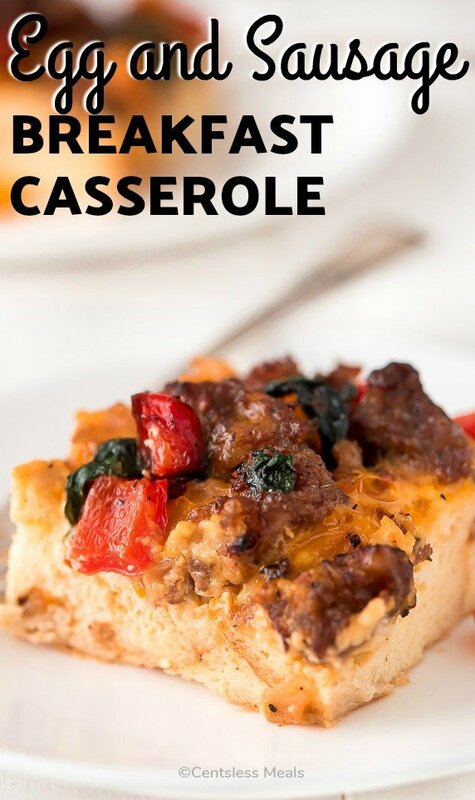 This makes it a great recipe addition to your meal prep rotation! 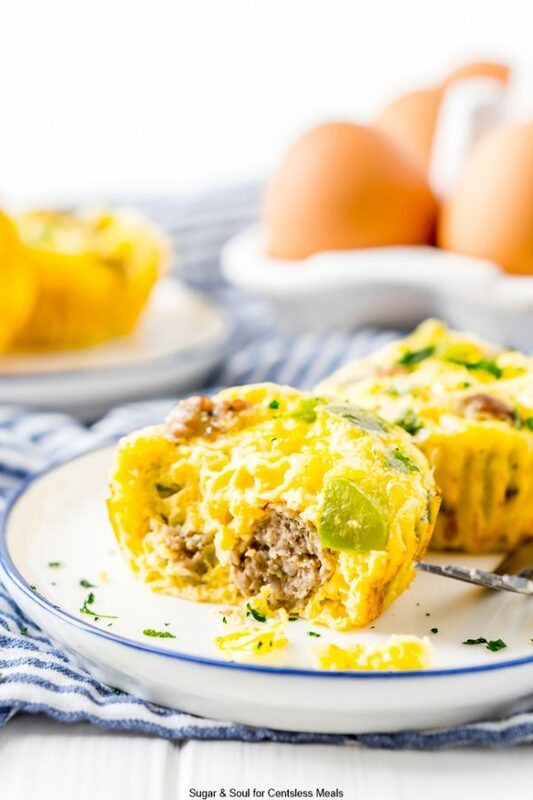 For this recipe, I chose to do green peppers and sausage, one of my favorite breakfast flavor combos. But you could easily do ham or bacon instead or even skip the meat altogether. Peppers, onions, and spinach all make great quiche additions. And feel free to play around with different cheeses too! A quiche is a savory tart usually made with a pastry crust with a filling of eggs, meat, cheese, vegetables, and milk and served for breakfast and brunch. This recipe is for crustless mini quiche. How Do You Make Mini Quiche? 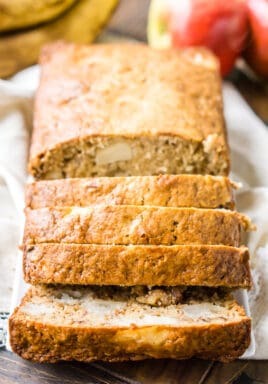 This recipe is a breeze to make and packs so much flavor! Mix things up with different add-ins like bacon instead of sausage and green onions and more! You’ll begin by preheating your oven to 350 degrees F and lining a cupcake pan with liners. Next, you’ll add your diced peppers and sausage to a large skillet with a bit of butter and saute until heated through and peppers are soft. Then, you’ll whisk together the eggs, milk, pepper, and onion powder in a large bowl. Then you’ll stir in the cheese and prepared peppers and sausage. Use a 1/4 cup measuring cup to measure the quiche mixture into the liners, bake for 20 to 22 minutes. 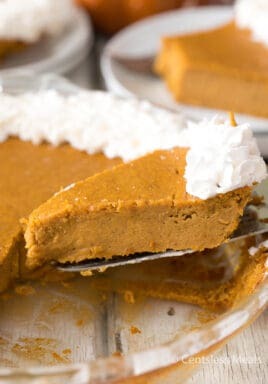 Remove from oven and enjoy immediately. The quiche may be stored in the fridge for up to three days or frozen for up to 1 month. How Do You Freeze Mini Quiche? 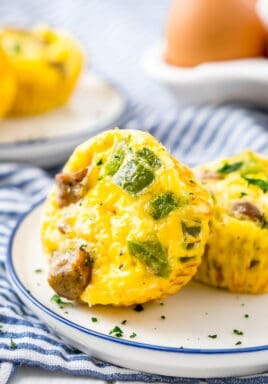 These delicious little brunch bites are actually really easy to freeze. 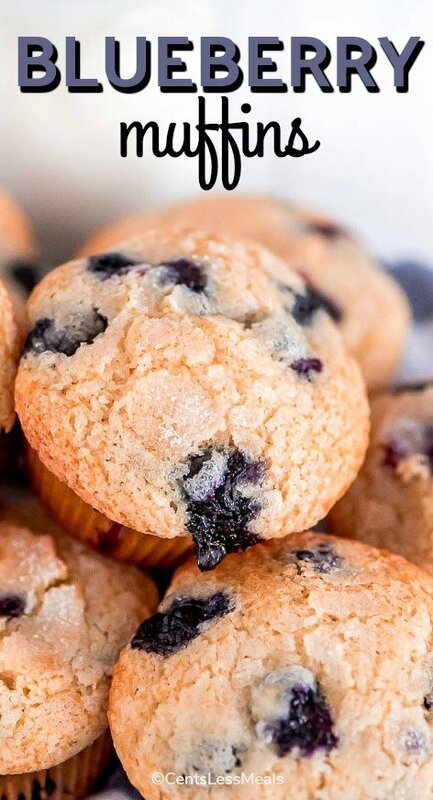 I would personally recommend baking them fully and then freezing them. Once they’ve baked, allow them to cool on a cooling rack. Once they’re no longer piping hot, arrange them in a single layer in an airtight container and place them in the freezer for up to one month. To reheat, preheat the oven to 400 degrees F and bake for 8 to 10 minutes until the quiche is heated through. I absolutely love easy breakfast dishes like this one, it makes both weekends and weekdays so much easier without sacrificing deliciousness! Another easy and delicious recipe for you to try is Overnight Breakfast Enchiladas – definitely another favorite of mine! If you are serving these up for brunch and have some time to spare, I highly recommend making my Buttermilk Pancakes too for a mix of sweet and savory! And don’t forget to serve these up with a Bloody Mary on the weekends! 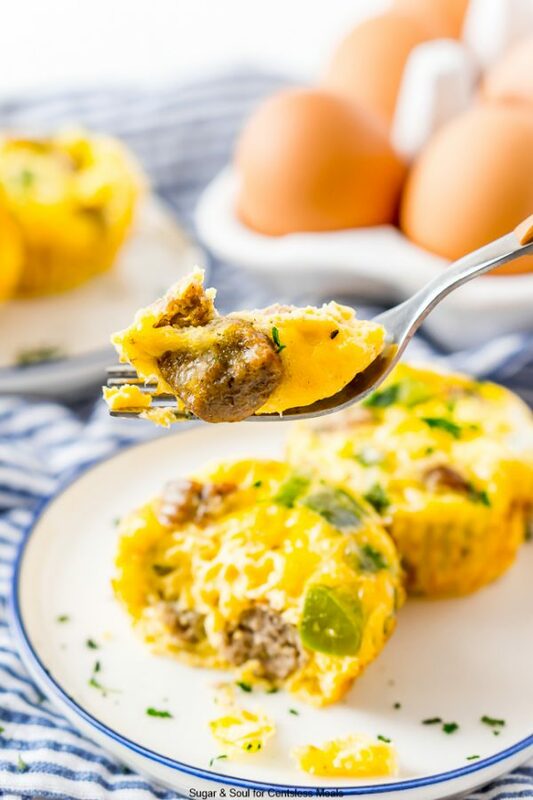 This Mini Quiche is loaded with sausage, peppers, cheese, and spice and perfect for weekend brunch and busy weekday mornings alike! Preheat the oven to 350 degrees F and line a cupcake pan with liners. Melt the butter in a large skillet over medium-high heat and add the diced pepper and sausage, cook until sausage is heated through and peppers are tender. While the sausage and peppers are cooking, whisk together eggs, milk, onion powder, and black pepper in a large bowl. Add the cooked sausage and peppers to the egg mixture along with the cheese and mix to combine. Use a 1/4 cup measuring cup to measure the egg mixture into the liners, there may be a little leftover, feel free to bake it up separately or discard. Bake the quiche for 20 to 22 minutes. Remove from oven and transfer to a cooling rack. Enjoy immediately or store in the fridge or freezer.